Nintendo has a very clear aim with Pokémon: Let s Go: to create something that younger fans - particularly those who've got hooked on the smash hit mobile game Pokémon Go - can sink their teeth into. The core of the game is still very much intact - you journey around, capturing pokémon to add to your gym and train them up to do battle with other trainers. It's been stripped back to make it accessible to newcomers, though. A good example is the game's starting point. In the traditional Pokémon RPGs you choose three pokémon to start your adventure with. In Let's Go you start with either Pikachu or Evee, depending on which edition of the game you chose (apart from the titular characters, Pokémon: Let's Go, Eevee! and Pokémon: Let's Go, Pikachu are basically the same). The complex systems that enable you to tweak your team within an inch of its life are gone, too. You can still tinker with baseline attributes using candles, but manageing your crew is a lot more straightforward. And, when you want to catch a pokémon all you have to do is land a well-timed throw using either a Joy-con controller or the special Pokeball peripheral. You can play with a pal now, too. With couch co-op, players can get together to boost their chances of catching whichever pokémon they have in their sights. Let's not forget the benefits of the big screens, either. This is a Switch game, so of course you can play it on the go. Being able to wander around the Kanto region on the big screen in your living room, supported by the oomph of the Switch hardware, is pretty exciting too though! 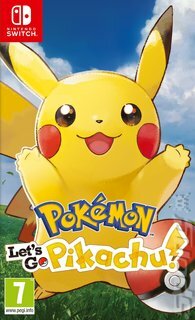 For kids looking to get deeper into the world of Pokémon or older players wanting to indulge in a spot of nostalgia, Pokémon: Let s Go is ideal.